Saturday was chilly and windy – a perfect day to braise. There is nothing like coming in from the cold to a house smelling of meat, carrots and onions. 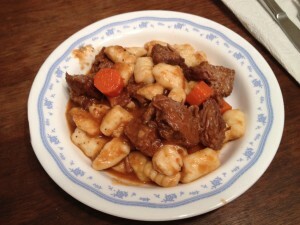 I was inspired by a dish I had at Highland Kitchen just a few weeks ago, so I made my favorite short rib recipe and decided to pair with gnocchi. The gnocchi recipe is from Cook’s Illustrated and it’s complicated and time consuming. I thought the gnocchi was delicious. They were light, fluffy, tender and flavorful, but still not worth the time, energy and mess I had created. I think I’ll stick to getting them from Capone’s, but if you feel like a embarking on a small culinary project, here’s the recipe. Enjoy! 1. FOR THE GNOCCHI:Adjust oven rack to middle position and heat oven to 450 degrees. Poke each potato 8 times with paring knife over entire surface. Microwave potatoes until slightly softened at ends, about 10 minutes, flipping potatoes halfway through cooking. Transfer potatoes directly to oven rack and bake until skewer glides easily through flesh and potatoes yield to gentle pressure, 18 to 20 minutes. 2.Holding each potato with potholder or kitchen towel, peel with paring knife. Process potatoes through ricer or food mill onto rimmed baking sheet. Gently spread potatoes into even layer and let cool for 5 minutes. 3.Transfer 3 cups (16 ounces) warm potatoes to bowl. Using fork, gently stir in egg until just combined. Sprinkle flour and 1 teaspoon salt over potato mixture. Using fork, gently combine until no pockets of dry flour remain. Press mixture into rough ball, transfer to lightly floured counter, and gently knead until smooth but slightly sticky, about 1 minute, lightly dusting counter with flour as needed to prevent sticking. 4.Line 2 rimmed baking sheets with parchment paper and dust liberally with flour. Cut dough into 8 pieces. Lightly dust counter with flour. Gently roll piece of dough into ½-inch-thick rope, dusting with flour to prevent sticking. Cut rope into ¾-inch lengths. Holding fork with tines facing down in 1 hand, press each dough piece cut side down against tines with thumb of other hand to create indentation. Roll dough down tines to form ridges on sides. If dough sticks, dust thumb or fork with flour. Transfer formed gnocchi to sheets and repeat with remaining dough. 5. FOR THE SAUCE:Melt butter in 12-inch skillet over medium-high heat, swirling occasionally, until butter is browned and releases nutty aroma, about 11/2 minutes. Off heat, add shallot and sage, stirring until shallot is fragrant, about 1 minute. Stir in lemon juice and salt; cover to keep warm. 6.Bring 4 quarts water to boil in large pot. Add remaining 1 tablespoon salt. Using parchment paper as sling, gently lower gnocchi from 1 sheet into water and cook until firm and just cooked through, about 90 seconds (gnocchi should float to surface after about 1 minute). Using slotted spoon, transfer cooked gnocchi to skillet with sauce. Repeat with remaining gnocchi. Gently toss gnocchi with sauce and serve.